Microcrystalline Wax’s fingerprint and water resistant qualities will make sure your decorative turned pieces are as protected as possible during normal handling. It can also be used for a multitude of other applications, including the cleaning and protection of leather, antiques and other valuable items. It is popular with woodturners as an overcoat to their final finish. Supplied in a 130g lever lid tin. I use the same base product as the market leader of microcrystalline waxes, giving you a comparable product for a lower price tag. 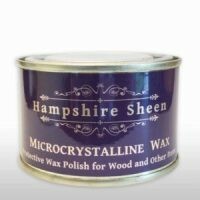 Related links to "micro wax"
Customer evaluation for "micro wax"